How much sleep and the quality of sleep children and teens get each day is important to their overall health and development, now and into the future. 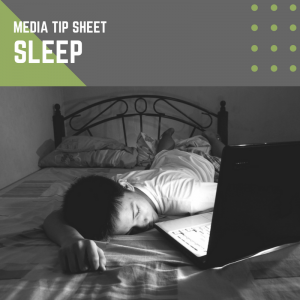 This tip sheet will help you understand how media affects children’s sleep. Use this information as a guide to help you choose media that are best for your child. Using screens before bed can excite children and teens, making it more difficult for them to fall asleep. The “blue light” from screens can disrupt a child’s circadian rhythm, which is the body’s internal clock that regulates when we feel sleepy and awake. When children sleep near screen media, such as a smartphone on their nightstand, or a TV in their bedroom, noises and notifications from these devices can disrupt their sleep, waking children and teens in the middle of the night. Not getting enough sleep can lead to many different health problems, such as difficulties learning, paying attention, and managing moods, and can contribute to unhealthy eating, weight gain and becoming sick. Help create a bedtime routine for children and teens that includes stopping the use of screen media at least one hour before bed. Set a house rule that all phones, laptops, and tablets are charged overnight somewhere other than their bedrooms. If they use their phone as an alarm clock, give them a regular alarm clock to use instead. Monitor how your child or teen is feeling, behaving, and doing in school. When they are acting particularly moody, doing poorly in school, or feeling sick, help them adjust their schedules and media use so that they are able to spend more time sleeping.